thank you to Apple, google, amazon for paying off my mortgage. Thanks to those companies! Boy, if this fact doesnt speak to why Jack Bogle is right about not picking individual stocks and buying the market as whole, I dont know what would! In a vacuum, it's disturbing. Approximately 50% of my equity allocation is international, so I'm not terribly concerned, though. The stock price of Netflix is quite mystery to me. From value investor point of view, the company financial is quite garbage with regard to its near 300 P/E ratio, 15+ years after IPO, still negative free cash flow, still heavy in debt and depends on borrowing for growth instead of internal cash flow. Its bond rating is several notches in junk territory. At peak growth mid 1990s time, Microsoft had 40% revenue growth, 40% net profit margin and zero debt, only had P/E ratio of 50. I don't understand what justify Netflix that kind of valuation. I don't know why wall street is so crazy about the company, maybe we now no longer have high quality growth companies like Microsoft, Cisco, Intel and Dell in mid 90s any more. Analogy to the cellular stocks in the early 90s. It's a per subscriber valuation. In a steady state they probably generate a lot of free cash flow. Probably the market underestimates subscriber churn and customer acquisition costs as competition intensifies. The cost of new content keeps escalating and Apple Amazon Disney all have deep pockets. But I would guess the valuation, such as it is, is based on discounted cash flow analysis per subscriber. And the mirrors historic cable company valuations, and Netflix appears to be eating their lunch. I suspect Microsoft and Facebook will match that definition for the foreseeable future. Amazon as well even though they reinvest everything. Historically, the majority of gains come from a small number of stocks so this isn't surprising. In addition, gains occur on a small number of days. Combined, that's a good reason to hold the market index and forget. Excellent observation. Wish I could upvote this. There is always a subset of stocks that generate most of the gains. Problem is we don't know in advance which subset that would be. For example, there was a time when energy stocks got to have a bigger than normal percentage of the market cap of the S&P 500. My guess is that this happened during the 1970's. During the 1990's, it was the Tech sector that got to have an outsized share of the S&P 500 market cap. Thanks for posting as this answers some of my questions. The short answer is people care more about # of users + volume of user data more than financials. Your point gets referenced a lot whenever someone is making the case for there being a bubble in the Silicon Valley/VC/startup space. So, this thread is misleading because it implies that you would have missed out on market gains except for these six maga-stocks. But these weren't the only stocks that have done well in 2018; they're just the ones that accounted for most of the wealth created in the stock market. The SPEE has gone up by about 5%. Small cap has gone up about 10%, midcaps by 6% and microcaps by 13%. So, you would have done just fine by not owning the SPEE and these six stocks had you owned something other than a large cap index fund, which many "tilters" do. It's really sort of pointless to point out that the largest stocks in a cap-weighted large cap index accounted for most of the returns - that's sorta the way it is pretty much all the time because of mathematics. If that is true, then the point I’m making is aren’t stocks dominant in their size, valuation, and influence at risk of underperforming going forward? If six stocks based on market weight and their returns have accounted for nearly all of the net gains of an index, is there more room for them to run? By definition they’re typically growth stocks, very expensive, and very influential; aren’t they then more likely to underperform, and have an outsized drag effect on the index? Since different sectors and different stocks take turns leading the market, at some point the leaders have already led and are destined to trail going forward? Of course it’s hard to know the when, even if you think you know the what. Also known as the Pareto Principle. Well...I had to Google that one. Funny how you can get completely sidetracked for 30 minutes. At least I learned something new. I haven't seen a study about it, but I've heard Meb Faber say that based on data from global markets, the firm with the highest market cap in a cap-weighted index tends to underperform that index significantly going forward. What you suggest is more or less an argument in favor of the 'incumbents' curse', a long-standing but now controversial theory. Here's S&P's summary out today of the contributors and detractors from returns year to date thru July 13. IT prevails but its contribution percentage is down. Amazon alone is responsible for nearly 19% of the total return. Interesting to note that the "detractors" are made up of some of the issues that historically provided the greatest returns to the 500: AT&T and the babies, Philip Morris, Altria, GE, P&G, 3M etc. YTD information tech still dominates, but its contribution is down. Interesting comparison and reminds me of the old fable about The Tortoise and the Hare. And it's a little surprising that older tech companies like Microsoft and Apple as well as financials Mastercard/Visa are right next to Amazon, Netflix and Facebook. I wonder if any of the latter three will suffer the same fate as the hare. It wouldn't surprise me too much if most of the "Detractors" performed along with the market in the long term. Yes, always fascinating--but probably useless--to know where the returns are coming from. Easy to be envious of the growth sector returns this year of something like 15%. However, those of us who merely do nothing but hold the index have done well: 5.86% total return through Friday. 3.03% of that all came in July in 13 days. And probably some day in the unknowable future the last shall be first again and value tilters will get the champagne, just like the small caps have done for the faithful and enduring ones ytd. I can remember in the nineties that Dell Computer was the major contributor to the 500's return; ditto at one point Eaton Vance. Indexers need to be grateful that there are investors who believe Amazon is worth 228X P/E. Interesting, however, that Walmart, one of the all-time great contributors in capital growth and dividends to the 500, never sold at anything like a valuation that high as best as I recall. Indexers need to be grateful that there are investors who believe Amazon is worth 228X P/E. Interesting, however, that Walmart, one of the all-time great contributors in capital growth and dividends to the 500, never sold at anything like a valuation that high as best as I recall. A big part of that is because when compared to Amazon, Wal-Mart had strong, consistent earnings all along the way, keeping valuations in check. Amazon has barely squeaked out a profit throughout their entire existence. Investors in Amazon are betting that earnings will eventually come down the pipeline in a big way. I don't believe Walmart has ever had a wholly-owned subsidiary similar to AWS. I don't recall one but the entry into groceries was a biggie, contributing 50% of total revenue today. With Netflix and Amazon, I believe the idea is that they are positioned to dominate a huge industry. Bulls believe that Amazon will have a large market share of the retail industry and computer storage industries, and Netflix will dominate the TV and movie industry. If you consider the size of these markets, the price is justified under those assumptions. Of course, no one knows if those assumptions are correct. Right it is just hard for me to believe there is much upside there. They may dominate there industries making the current price is appropriate and thus they give reasonable returns as earnings come and P/Es go to more normal levels. However, if they don't meet expectations they have a long way to potentially fall. My understanding is Netflix is basically priced as if it will account for 50% of the entire TV industry in 10 years. That just doesn't seem very likely to me. The are even directly competing with Amazon in this area. In addition its hard for them to do much better than what they are already priced for. Your beliefs are not actionable. My understanding is Netflix is basically priced as if it will account for 50% of the entire TV industry in 10 years. That just doesn't seem very likely to me. I agree that it is unlikely that Netflix will account for 50% of the entire TV industry in 10 years, but I suspect that the analysis that led to the conclusion that Netflix is priced to that level of market share is flawed. But as @minimalistmarc says, that's neither here nor there. It's irrelevant information when you hold a market portfolio. Those stocks giveth and they can certainly taketh away too. Netflix down 14% after hours on missed earnings. I'm very happy with that! My trend following strategy has had me primarily in large cap growth this year. My portfolio has returned 8.2% this year, compared to SPY's 2.5%. Can you expand please? Which one of them are you using? There are two components to the strategy I use: one which signals whether I will be in stocks or bonds, and another which signals which stock classes to be in. For the first, I am in stocks unless both the unemployment rate is above its 12 month moving average and all stock classes are below their 7 month moving average. For the second, when I am in stocks, I invest in the stock class (e.g. U.S., international, LCG, SCV, etc.) that has had the highest relative performance over the last 7 months. For the second component, which class I'll be in varies from one account to another because I have limited investment options in my 401k, 457, and HSA. Maybe buy all top 10 stocks by market cap on s&p 500, and call it a day? 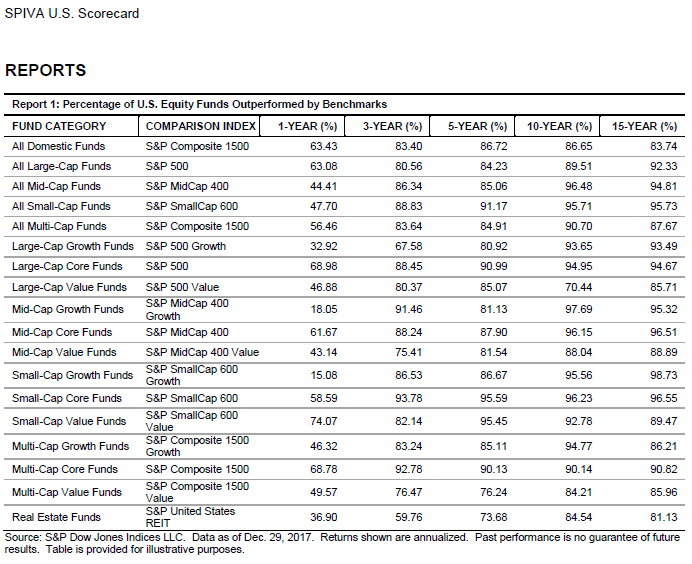 How's top stocks performance compare to the index? Over what time period? Do you equal weight them, or hold them at market cap weights, some other way? Do you buy the top 10 at one point and never trade them, or switch them every time one of the top ten changes? Switch every year or two to prevent Kodak or enron moment as they change and equal weight them, and let me run as long as they don't fall off the list. In general, the larger stocks would tend to be lower risk/lower return than the smaller stocks. You could probably improve both the risk and return by holding more than 10 stocks. The S&P 100 (top 100 stocks) has had lower standard deviation, but also lower returns than the S&P 500. Equal-weighting the S&P 100 stocks though, tends to increase the risk, but also has had higher returns than the S&P 500. Somewhere around the top 50 stocks make up half the market-cap of the stock market, so by equal-weighting the top 100, you would wind up with more exposure to smaller size stocks than the cap-weighted S&P 500. The first component of my strategy comes almost directly from that site. The second component is a simple asset rotation method. I don't expect to outperform the market over the long-term, but I do expect to achieve very similar returns with less downside risk. We'll see if it pans out that way. Someone needs to back test this. The top 10-20 s&p 500 looks bullet proof if you keep trading them and not hold it too long until they crash and burn. Last edited by Momus on Tue Oct 23, 2018 1:00 am, edited 1 time in total. Probably the same stocks. Buy MANGAF! The Pareto Principle on steroids. If only that were a bit catchier- give me an i-stock so we can have MANGIA. Isn’t it true that a handful of stocks have explained most of the growth in the market for most of history? Yes. Around 90% of stocks have had real returns of 0% or lower over the long-term. If that is a fact, it is very interesting. The vast majority of stocks lose money or, at best, break even. Here's a relevant quote from a recent academic study. When stated in terms of lifetime dollar wealth creation, the best-performing 4% of listed companies explain the net gain for the entire US stock market since 1926, as other stocks collectively matched Treasury bills. It shows how numbers can be manipulated to paint all kinds of different incomplete stories that fail to explain things like why just about anyone using reasonable judgement could pick 10 public stocks that they think others would agree are large reasonable companies and the performance would likely be well inline with the averages. It may be that the top market-cap weighted stocks are frequently more "high priced" relative to others at the time of purchase. The consolation, is that in 20+ years when you're withdrawing from the portfolio whatever the new "high priced" stocks are will be the ones you're selling more of. Is there a better strategy an investor can follow over their investment lifetime? The SPIVA scorecard results suggest probably not... and over longer periods of time the likelihood that a market-cap weighted strategy turns out better than alternative more active strategies looks better and better. These are all familiar and famous stocks. Why not just buy these for 2019? Surely they will all do better than average yet again. I don't expect to outperform the market over the long-term, but I do expect to achieve very similar returns with less downside risk. We'll see if it pans out that way. So you're okay with 2 to 3% CAGR over the next decade? I don't have much choice in the matter, now do I? That being said, I really don't know. Even if the market returns 3%, my returns might be very different. For instance, while stocks had a flat decade from 2000-2009, most trend followers did well. My chosen strategy would have returned about 7% CAGR over that period.